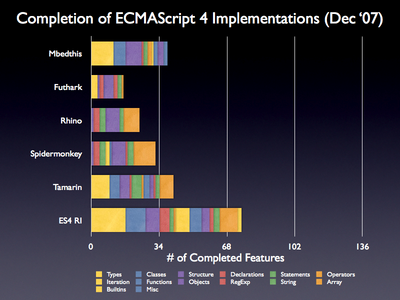 I’ve just completed my first survey of the current ECMAScript 4 implementations. I went through and attempted to compile as many bugs and features as possible, as stated by the ECMAScript 4 specification and double-check them against all the actively-maintained implementations. You can view a nice overview below. I think it’s fascinating to note that there’s 3 implementations that already have over 25% of all the new features in the language implemented.